On this day, 12th April 2019, gathered here are Primavera Tours together with all those involved, to informally and without constraint constitute the Cave Sound Preservation Society. Below you will find its statutes agreed by absolute unanimity, to the sound of the first chords and of the raising the first glasses. 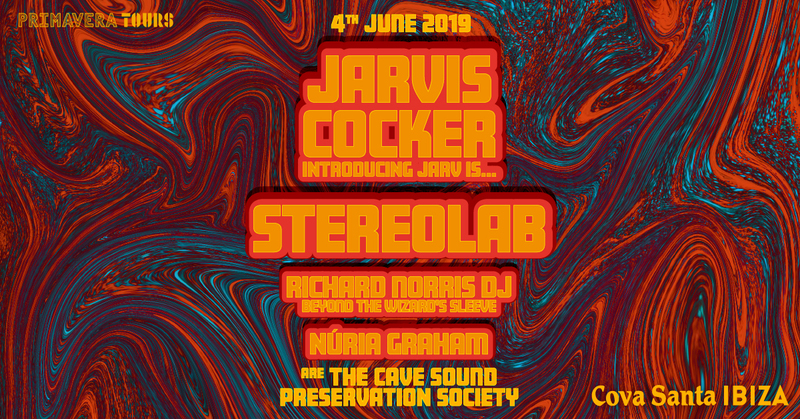 The Cave Sound Preservation Society is the party that will bring together, in an ephemeral and unrepeatable way, Jarvis Cocker and Stereolab with other friends on Tuesday 4th June in the Cova Santa in Ibiza. There are things that only happen once in this life, and the coincidence of these two icons of contemporary music under the magical influence of the island, taking advantage of their presence at Primavera Sound and NOS Primavera Sound, is one of them. The Cave Sound Preservation Society will be: one (1) concert of the new show Jarvis Cocker introducing JARV IS; one (1) concert of the comeback tour of Stereolab; one (1) concert by the Catalan artist Núria Graham; and (1) a cosmic grooves session with Richard Norris (Beyond the Wizards Sleeve). All of this will happen outdoors, under the starry skies of the island, around the entrance to a cave and with a very limited capacity. To sum up, one (1) totally unique experience. The Cave Sound Preservation Society will profess equal love for nature and for the historical and musical fellowship of Ibiza. Avant-garde pop marks the stylistic path along with contemporary psych, tropicalia, kosmiche, dub and ambient: any style that draws inspiration from the island or inspires the island can be a part of our preservation society! Several: a natural cave discovered in the XV century; a new show by Jarvis Cocker; a return to the musical essence of the island; a concert by Stereolab amongst their first in ten years; the happy nostalgia of Núria Graham; the musical legacy of Richard Norris of Psychic TV and The Grid, who has collaborated with Bryan Ferry, Marc Almond and Joe Strummer among others. In essence: a celebration with Jarvis, Stereolab and friends in Ibiza! The Cave Sound Preservation Society will convene and dissolve within the same night. Everything that happens at Cova Santa within those hours stays is shared amongst those present, who will draw and share inspiration from it... And who knows? Maybe next year it will happen again if the stars align. - Reduced price ticket in Ibiza: 38 € + distribution costs. A small quota of tickets will go on sale for Ibiza residents that will only be available on Ticketmaster through its Halcón Viajes shop (Av. d'Isidor Macabich, 42) and Viajes Ecuador (Passeig de Vara de Rey, 3) in Ibiza. The purchase of tickets must be made in person. Entry prohibited to children under 18.